The Admin Calendar allows you to quickly and easily keep track of all your orders. 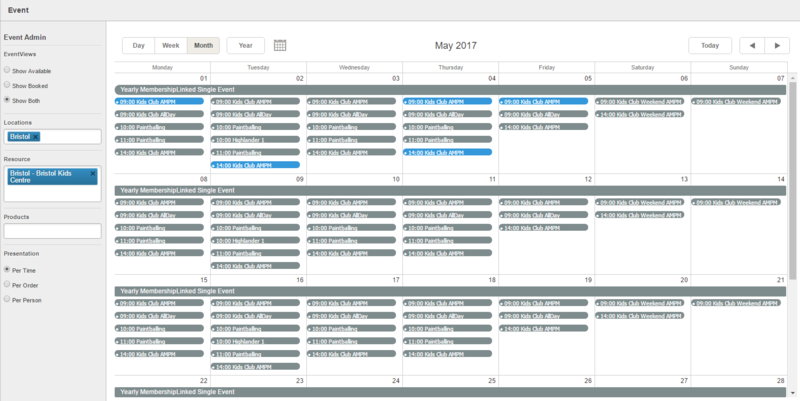 You can view calendars for a day, week or month view. Events on the calendar are colour coded based on the status of the event. The Day, Week and Month views all work int he same way, just with different timescales. You can see when events are running on the days as seen in the images below. The Year view shows days that have events running (highlighted in yellow), and you can hover over the day to see a simple list of the events that are running on that day. An event which lasts less than a day appear on the Day and Week Calendar views next to their corresponding Start and End times. Multi-Day Events that take place over consecutive days are displayed at the top of the views. As you can see fromt he above images, events are shown with different colours and with various icons/info boxes on them. Indicates that this event is below the Products "Minimum Attendance Level"
As you can see from the images above, the Admin Calendar has a series of filters on the left-hand side of the screen. These filters can be used to quickly de-clutter the calendar, especially if you have a lot of events running on your system. Changes how Bookings are grouped. To add a booking click New Booking. This will take you to the booking page where you simply follow the on-screen instructions. Clicking this button allows you to send messages to all Participants booked on to an Event. If you want to leave a Participant out of the message simply input their name in to the Sen to all except field. To message one Participant click Message next to their details on the Manage Event page. Once Participants have turned up for an event you can tick them off the check in list to record their attendance. If you have this feature set up you'll be able to view the participant details of those booked on to the Waiting List within this section.